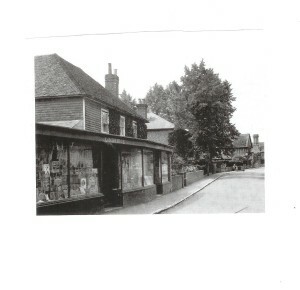 During the 19th century and much of the 20th century, there were many shops and businesses in Leigh and more than one grocery store – in fact a self-contained community with little need to travel far: a trip to Tonbridge would have been possible but in winter, it would have been difficult. Of course people were much more accustomed – or prepared – to walk long distances than we are today. The Humphrey family were one family of shopkeepers during much of the 19th century and ran the store that was located at what is Great Brooks today: this store later incorporated the Leigh Post Office when a service was established in the mid-19th century. The Post Office in Leigh in the 19th century would have been a centre for the village where people would have met and gossiped. This grocery store and post office was later known as Andersons, when it was taken over by William Anderson in about 1880, after the Humphrey family gave up the Leigh business (although a John Humphrey still had a business in Hildenborough for a while). Church Hill House was a butcher’s shop, occupied in 1870 by Mr Outram, and in the 20th century there was a butcher at Southdown House. Later there was a small butcher next to Great Brooks on the Green. Other stores, shops, trades in the 19th century and 20th century in Leigh included another general stores in the High Street (where Johnsons is now), there was a butcher’s shop, wheelwrights, smithy; at one point there was a dairy behind the Cricket Pavilion. There were also shops and other tradesmen down the Halt Road (Lower Green): the Bakery thrived well into the mid-20th century; there was a shoe repairer, an antique shop, bicycle shop and even a fish and chip shop for a time; and in 1950s there was a printers workshop. Even in the early 1990s, Leigh had a Post Office/Delicatessen – at Great Brooks, next door to which was the butcher’s shop, there was the general store (Johnsons) and the Clock Shop, as well as the Garage, Fairlawns and the Dart Garage. And, of course there was also ‘The Stores’ in the High Street (where Genesis and Orchard House are now). Run by another family of shopkeepers in Leigh, the Crandall family, who had become tenants of Orchard House in 1766 and were to remain shopkeepers in Leigh throughout most of the 19th century, although the house was only converted to a shop in 1861. The General Store – under Mr Lindridge, early 1920s. William Crandall 11 described as shopkeeper. Passed to son, William III – a linen draper (of Maidstone). Then in turn to brothers John and Henry Crandall. Purchased by Tony Woodburn: one half of the shop became an Antique Clock Shop run by Tony Woodburn; the other half, backing on to the school, became ??? (DETAILS TO BE ADDED). The half of the shop backing on to the school was taken over by Genesis hairdressers. Orchard House Purchased by Adrian and Catherine Winbow: 1998 Clock Shop converted back into the House but Genesis remained independent business.